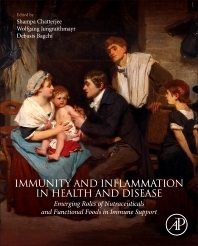 Immunity and Inflammation in Health and Disease: Emerging Roles of Nutraceuticals and Functional Foods in Immune Support provides a comprehensive description of the various pathways by which the vertebrate immune system works, the signals that trigger immune response and how fnew and novel nutraceuticals and functional foods, can be used to contain inflammation and also to boost immunity and immune health. Inflammation is a tool to fight pathogens and the vertebrate immune system has a very complex network of cells to achieve this. However inflammation that goes awry is also the leding cause of several diseases ranging from cardiovascular diseases to diabetes. This book covers the entire gamut from the various cellular players in the inflammation-immune response to its ramifications in terms of protection against pathogens as well as in onset of metabolic, aging and auto-immune related diseases. Finally, the balancing role of dietary nutrients between host defence and immune support is also showcased. The first three scetions explain the various components of the immune system and their modes of activation. The fourth section deals with the ramifications of a robust and execessive inflammatory response. The fifth section is focused on the association between nutrition and immunity and how deficiencies in certain nutrients may affect immunocompetence. The sixth section chapters represent a vision of paradigm shifts within the field and discusses possible future directions. This bool will be a valuable reference for researchers studying immune health either in academia, or in the nutraceutical or functional food industries. Product developers in nutraceutical, supplement, functional food, and health food companies will also appreciate the information presented here. 26. Nutrition as a Tool to Reverse Immunosenescence? Dr. Shampa Chatterjee received her PhD in Chemistry from the Indian Institute of Technology (Bombay) in 1997. Her research interests are in the field of reactive oxygen species (ROS) and redox biology as it relates to inflammation. Her lab studies the effect of ROS generated by the vascular wall in onset of inflammation. Toward this, work from her group shows that signals emanating from the wall of blood vessels are the earliest stimuli for the onset and amplification of inflammation. The topics addressed in this book are thus central to her research where she tries to unravel the balance between host defense and inflammation induced damage. Currently, Dr. Chatterjee serves on the Editorial Board of several journals in the field of pulmonary physiology (American Journal of Physiology: Lung Cellular and Molecular Physiology, Pulmonary Circulation and Jacobs Journal of Physiology). She has published more than 50 papers in peer reviewed journals. She has also received numerous awards such as the Carolin Tum Suden young Investigator Award, and the Hermann Rahn award for Excellence if Pulmonary Physiology in 2015.